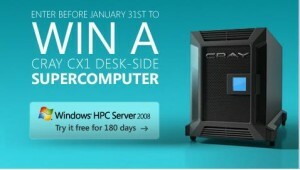 go to link Microsoft is running a promotion until Jan 31 2009 where you can win a CRAY CX1 Desk-side SUPERCOMPUTER. How much geek cred would you get if you had this bad boy under your desk?! Awesome!